Pastor District Elder Allen Smith was baptized in Jesus’ name and filled with the Holy Ghost as a child in Albany, Georgia. After graduating from Augusta College, he moved to Atlanta, Georgia in 1976 and started attending Bethlehem Healing Temple Church under the leadership of our late Bishop Dr. Louis H. Jackson, Sr. and Evangelist Mildred Jackson, where he answered God’s call to preach the Word. In July 1980, he and Sister Carolyn Smith were married. They have five beautiful children and five wonderful grandchildren. Pastor Smith was an Art teacher for the Fulton County School System for 23 years. 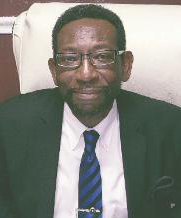 He served faithfully as Assistant Pastor for over 30 years under the leadership of Greater Atlanta Healing Temple’s founder, Dr. Bishop Louis H. Jackson until Bishop Jackson’s death in November 2016. In December 2016, District Elder Allen Smith was installed as the new pastor of Greater Atlanta Healing Temple Church. Today he and his wife, First Lady Carolyn Smith, continue to stand in the Apostles’ Doctrine as they lead Greater Atlanta Healing Temple to higher heights in the Lord.